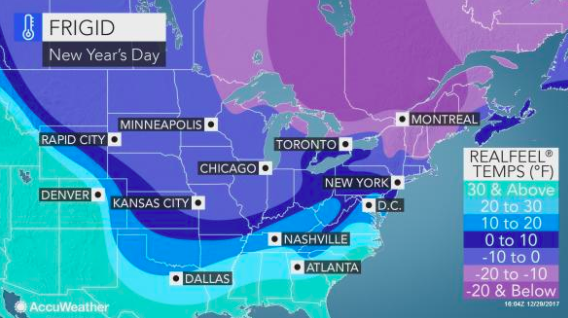 Cold air rivaling that of the past 100 years for late December and early January will make it painful to be outdoors and may lead to damage in the central and northeastern United States. AccuWeather RealFeel® Temperatures are projected to be below zero over much of the Northeast and well below zero in much of the Midwest. In the coming days, RealFeel temperatures 5 to 20 degrees below zero will be common. in the northern tier, RealFeel temperatures may dip as low as 30 to 40 degrees below zero. Most low-temperature records from the northern and central Plains to the mid-Atlantic and New England are likely to remain intact. However, in terms of the level of cold, actual temperatures in many locations will be in the lower 5 percentile for all years on record for late December and early January, according to the National Weather Service. Standout years for record cold in the Northeast at this point in the season were in 1880-81 and 1917-18. In the Midwest, the years 1967-68 and 1973-74 left a mark with subzero F cold. 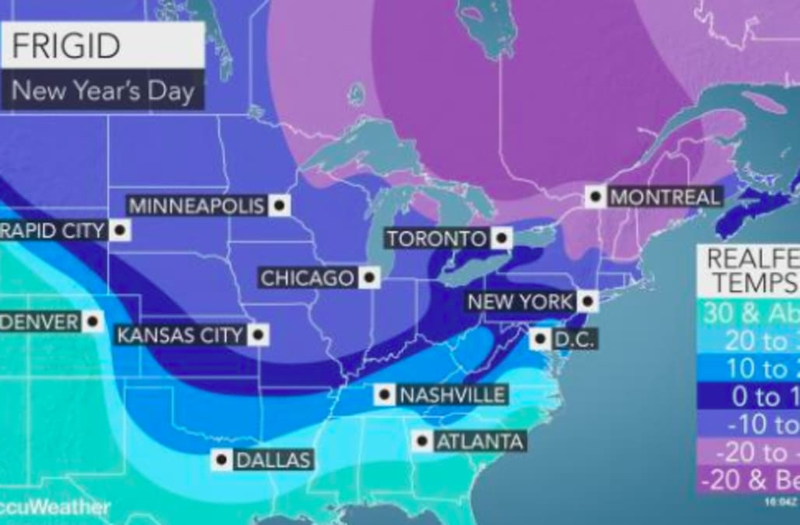 "While the level of cold will vary from one day to the next, indications are that the frigid weather will linger through the first week of January in the Central and Eastern states," according to AccuWeather Long-Range Meteorologist Max Vido. "It may not be until toward the second or third week of the month before many areas get above the freezing mark for a time," Vido said. The severity and persistence of the cold blast may take a huge toll on the homeless. Energy demands will skyrocket. Household heating budgets may take a huge hit. Some forms of commerce may be negatively affected as people spend a minimum amount of time outdoors other than commuting to and from work and school. The anticipated severity of the cold weather may postpone some traditional outdoor New Year's festivities. Whether you plan to celebrate in the streets on New Year's Eve or head to the slopes to do some skiing, multiple layers of clothes are best. At this level of cold, the risk of frostbite is greatly elevated for those spending more than a few minutes outdoors. The extremities, such as fingers, toes and ears, are at greatest risk. Consuming alcoholic beverages increases the risk of hypothermia, if not alert and properly dressed, according to the Mayo Clinic. Be sure to check on young children and the elderly as they are more prone to having serious health issues in these conditions. When traveling, be sure to bring along blankets, knitted hats and gloves in case your vehicle becomes disabled. In addition to health concerns, the severe, penetrating cold may cause pipes and water mains to burst. Be sure to promptly report persistent running water through yards and streets to the local water authority or the police if unsure. A simple matter of opening cabinet doors and removing a few ceiling tiles may be enough to prevent costly damage in poorly heated and insulated areas. Property owners that will be away for a length of time may want to allow water to drip from faucets in the coldest rooms. Under no circumstances should property owners attempt to thaw pipes with an open flame due to the risk of starting a fire. Never leave space heaters unattended and only use in an open area away from furniture, rugs and clothes.